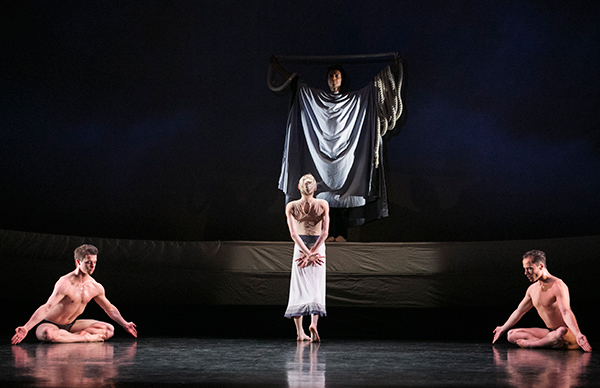 Graham’s connection to The Rite of Spring began in 1930 when she was propelled into international fame starring in the first American production of the work choreographed by Léonide Massine and conducted by Leopold Stokowski. In 1984, she decided to return to the score and create her own choreography for the Rite. The primal physical expression that is the hallmark of the Graham style has a deep connection with the primitive essences evoked in Stravinsky’s revolutionary score. The community in Graham’s Rite is defined through the complex, yet clear geometric patterns for the group that harken back to her ground-breaking works from the 1930s such as Primitive Mysteries and Dark Meadow. The organized structure for the group is a calm, somewhat disturbing, counterpoint to the violence of the story and vigorous physicality of the movement. Her choreography for the work, created over fifty years after she starred as the Chosen One for Massine, bookends her long creative career. Elements of her many theatrical innovations are distilled into this masterwork, one of her last.